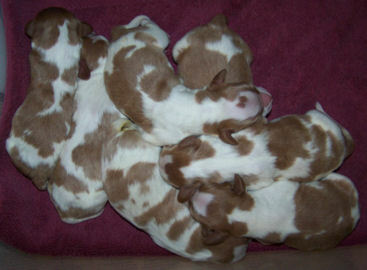 All pups have gone to their new homes! :-) Todd. 1. 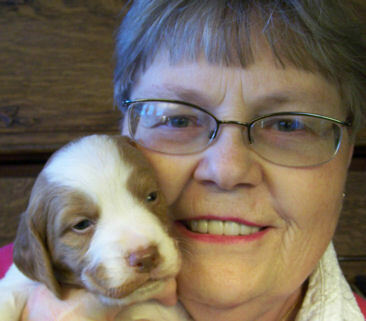 Chickadee (Girl) "Dee Dee"
Friend and neighbor Shirley with Dove, 7 wks. 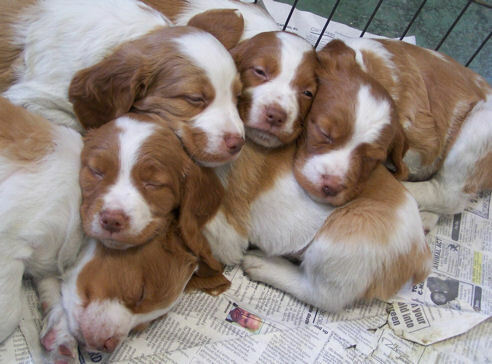 To sleep, per chance to dream.... of pheasants!!! 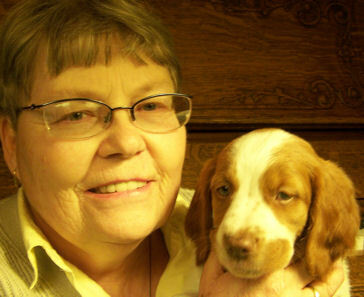 Friend Shirley with Eagle at 3 weeks old. We are no longer accepting deposits. You can be added to our waiting list if you request. 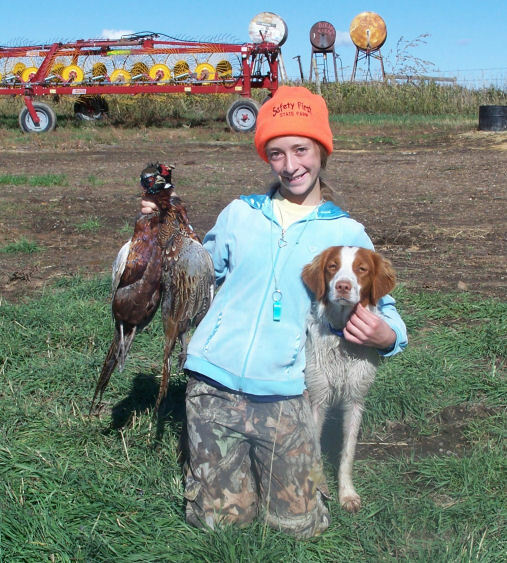 Sari with Jesse and a couple of Montana roosters he pointed and fetched. CH Warbonnet's Wild Wild West JH, RN "Jesse" - Also: NADAC agility titles: NAC, TN-N, TG-N, HP-N. Whelped: 12/18/04. OFA Good, Elbows: normal. OFA #: BS-13666G27M-PI. By DC Wyngold's Tough To Touch x CH Wyngold Wyndy Warbonnet, bred by us (Todd & Jan Breitenfeldt) out of Wyndy and Redd. Jesse is a happy, full of energy, typey, classy looking dog with great motion and bone who's tail is always up. He likes the show ring! 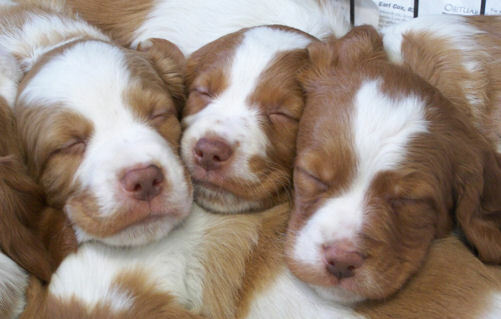 Definitely the dominant pup of his litter, yet a real easy going all-a-round-nice-guy type. "Every one likes Jess and he likes everyone!" 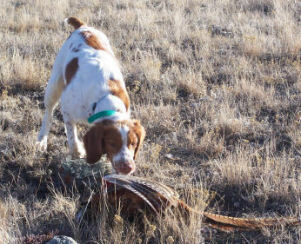 He has real good intensity on birds, is great with pheasants, and is a gun dog range working dog. He is part of the family and is doing hunting, field trials, hunt tests, shows, rally and agility. 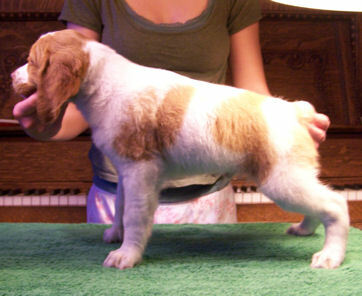 Jesse earned his show (conformation) championship in May, 2006 at 17 months of age with four majors (1. Helena, MT, 2. Portland, OR on a Brittany specialty weekend, 3. & 4. Spokane, WA May, 2006) in 14 shows. He also has his Junior Hunter hunt test title. He has 2 field trial puppy placements and is doing the most important thing - HUNTING!!!!. 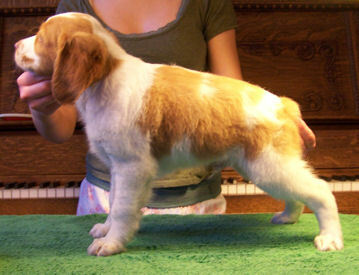 Look to see him occasionally in the Specialty ring, rally, agility and advanced hunt tests, as he matures even further. We would be glad to co-own him with a quality Junior Handler who wants a real nice, fun dog to show, rally and agility with.